No tankers wanted here, suh! At the behest of the very effective Dogwood Institute, here’s my letter to the new Liberal party environment critic,Gerard Kennedy. Oil tankers in the Great Bear Rainforest region, and the attendant Enbridge pipeline, are such monumentally bad ideas that they take my breath away. If we put all that money and effort into sustainable energy strategies and technologies … we’d be there in 20 years. We’d never have another serious energy crisis, or climate crisis, or oil war. Europe is well on its way. I want us to be too. As you know, there’s a controversy going on in B.C. over the connected issues of oil tankers and the proposed Enbridge pipeline from the tar sands. I am a resident of Tofino, in Clayoquot Sound. But i also consider myself a citizen of an ever-shrinking world, and i am doing what i can to make the world a better place for both our children and the larger ecosystems we all depend implicitly upon for our very lives. I am deeply concerned over how corporate needs — for raw materials, for weakened legislation, for unlimited profit — are trumping human needs in every sphere. Our present government understands nothing, it seems, but economic growth, and is content to lay waste to the earth in its bid for a “healthy” economy, no matter how unlivable that world is for people. Your Liberal party is Canada’s best hope for widening this ruinously narrow vision of our future, and as Liberal Party of Canada Environment Critic you are well placed to have a positive influence over what transpires in coming years. We both know that allowing oil tankers to traverse Hecate Strait, Dixon Entrance, and Queen Charlotte Sound will over time guarantee that oil spills will happen. Of even greater concern to me is that continuing to build oil infrastructure, especially around dirty tar sands oil, only makes our climate crisis worse, and at the same time distracts us from building a sustainable energy infrastructure. This path is pouring money down a rathole, and makes the consequences for our climate future even more dire than they will apparently be already. It is a grossly irresponsible choice for a government to make. I urge you and the Liberal party to do what is right: please commit, loudly and publicly, to a legislated ban on oil tankers through Canada’s Pacific north coast. And time is of the essence — please do it before the end of the year. Thank you for a principled, meaningful stand on environmental issues! I’ve been meaning to post this for a while: my review of my friend Shirley’s new book. This is the dry, newspaper review; the Tofino Time one is more fun, but it ain’t on-line yet. It has been her labour of both love and obsession for years, and now it’s finally out. 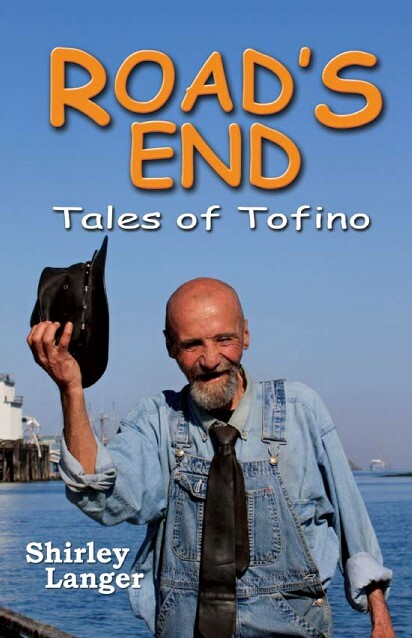 Locals will recognize Tofino man-about-town Turtle smiling from the cover, as well as appearing in a couple of the stories within. Many other locals, past and present, may see themselves in the pages of Road’s End—Tales of Tofino, a new book by Tofino’s own Shirley Langer. It’s a fun read. Shirley’s got a knack for digging up good stories and telling them. It’s like a lazy walk around town, bumping into people on the sidewalk or eavesdropping on them in a coffee shop. sound –- noun 1. a relatively narrow passage of water between larger bodies of water or between the mainland and an island: Long Island Sound. 2. an inlet, arm, or recessed portion of the sea: Puget Sound. 3. the air bladder of a fish. In geography a sound or seaway is a large sea or ocean inlet larger than a bay, deeper than a bight, wider than a fjord, or it may identify a narrow sea or ocean channel between two bodies of land (see also strait)…. There is little consistency in the use of ‘sound’ in English-language place names…. A sound generally connotes a protected anchorage. I’m still looking for some official nautical definitions. sound –- n. 1. a narrow channel or stretch of water, esp. one between the mainland and an island or connecting two large bodies of water. 2. an arm of the sea. I spent the weekend at a men’s retreat. This bastion of the 1980s and 90s seems to have plummeted in popularity since the millenium (a Google search on “men’s retreat” brings up a scant 434,000 hits), which brings up the burning question “Why?”. Could it be that men are now so bonded and well-adjusted that they no longer need the rituals and self-affirmations of encounter groups. I doubt it! Still, i found the retreat idea intriguing, especially since it built on a Men & the Environment conference that featured Victoria’s eco-uber-guru Guy Dauncey, whom i’ve wanted to meet for a long time. Man and the (degradation of the) environment . . . call it a hunch, but is there a connection there somewhere? I went to both events. So the five stages of men’s retreat for me seem to be: trepidation, hope, deliberate participation, fear of hugs and tears, fun, annoyance, bemusement, getting lost in the woods, and hesitant embrasure. (How many is that?) It was an interesting experience. An eclectic 14 guys — no, men, let’s not shy away from the word — many of whom had experienced the movement years before, some drawn to it, some pushed by crises in their lives. What did we do in those two days? None of your business is my first response. There’s a reason rituals are guarded — their secrecy gives them much of their force. The big surprise for me was realizing that ritual does have power. Heretofore i’d looked upon it as play-acting or metaphor, and assumed that what efficacy it had comes not from the acts themselves but from their attached cultural significance. I was wrong: the ritual itself induces change in one’s thinking and the conduct of one’s life. And it works in ways that nothing else can. The more i think about it (i’m writing this ten days later), the more i realize the extent to which it has affected me. And the greater my dedication to the arts, which i see as ritual in another guise. Men’s groups, as it turns out, also come with lots of gushy language and touchy-feely superlatives, to which i am NOT attached in this age of rampant and meaningless exaggeration. (That piece of toast was to die for, it was amazing, it totally changed my life! Pah!) So part . . . much . . . most of my reservations are me being uncomfortable with the physical and the sharing aspect of the weekend. I have pretty much NO experience spilling my guts to men, and that brings with it the correspondingly meager comfort level. The whole exercise is pretty much one of creating a safe place for men to be with each other in a meaningful way, which is the key. There are plenty of safe places for men — work, the bar, the street, a sports field — but none are particularly meaningful and in none of them do we dare spill our guts or say what’s really on our minds. That’s necessary but almost impossible to find outside of the formal men’s circle. Would i do it again? I would. I probably will. I might even start organizing a men’s group wherever i end up settling down. Michael Tacon, of the Well Foundation, grandfathered the whole thing. [The] purpose of the rituals was to re-enter our own mythological space and reconnect us individually to our universal nature. Once we reconnect to that, then we can return to the work immediately in front of us. Guy Dauncey reminded us that that there is an urgent need for leadership today. We engage where our higher self intersects with our natural skills. John Shields, ex-priest and current executive director of The Haven (25 years of personal growth courses on Gabriola Island — How could i not have heard about this?‘), wound the weekend up with a striking cosmological perspective of, well, the universe and everything in it. The man has presence. Brought tears to my eyes. The conference and the retreat were organized by the Well Foundation of Victoria. It was held at the YM/YWCA’s Camp Thunderbird, near Sooke. Dauncey, incidentally, lives in Saanich, Vancouver Island, and runs earthfuture.com and puts out the Econews monthly newsletter. If you’ve got those world-in-the-toilet blues real bad, Dauncey’s the pill. (Him and action, at any rate.) The man’s an optimist and a visionary and his uplifting message is oh, so welcome in these dark, dark times. Do yourself a favour and check it out.